When we lose our sense of urgency to live for God, we end up wasting our time! God has a plan for us, for our world, and for his church. 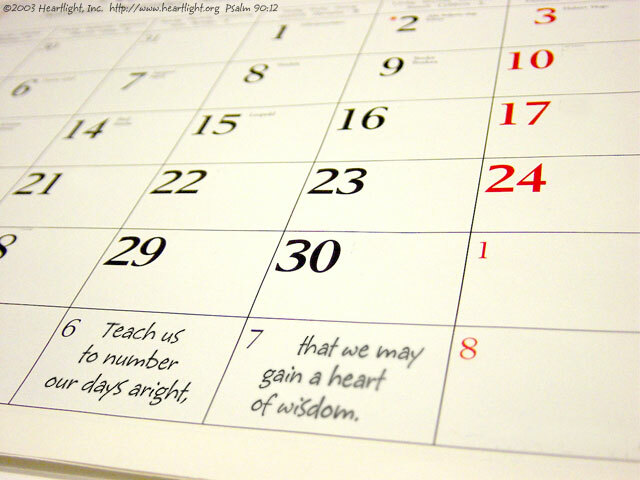 Without God's gift of "spiritual arithmetic" (numbering our days aright), we will never gain a heart of wisdom. So how do we get such a gift? Ask for it without doubting (James 1:5-7)! Trusting the Lord for wisdom has a huge effect on us and the way we conduct our lives. Rather than losing heart, God gives us a heart of wisdom! Holy and Almighty God, King of the Ages, you alone live in complete wisdom, justice, and grace. Please help me to know what time it is in my life and the role you want me to play at this stage of my journey. I want my life to be lived glorifying you. In Jesus' precious name I pray. Amen.